A light year is a measure of distance equal to about 5,874,589,152,000 miles and is the distance that a particle of light can travel through space in one Earth year. Light years are used to measure interstellar distances. The nearest star to the Sun is Proxima Centauri at 4.2 light years. 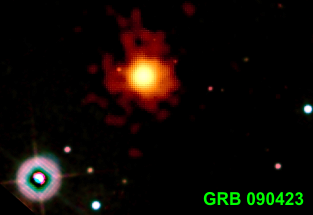 At the time this entry was written, the farthest star so far detected produced a gamma ray burst called GRB 090423. It was discovered at 3:55 a.m. EDT on April 23, 2009 and is 13.035 billion light-years away.